Abstract: Radiant heat gain through windows is a major source of thermal discomfort in buildings. Thus, optimal shading of windows is essential, especially in air conditioned buildings. However, the shading of windows reduces natural lighting. Artificial lighting carries more heat energy than natural light so adds to the thermal discomfort. This dilemma can be resolved by replacing conventional shading with light guiding shades (LGS), see Fig 1. LGS provide optimal natural lighting and optimal shading of windows. As LGS can replace roof eaves an economic offset results where shading and natural lighting can be obtained with no additional building cost. For air conditioned buildings reduced running costs and greenhouse savings are an additional benefit. Fig 1. Light guiding shades provide optimum shading and optimum natural light. 6. Economics : Air conditioning : installed cost, running cost. 1. Background to the development. An adequate thermal and visual environment in classrooms is essential for the health of children. In summer thermal discomfort may occur due to radiant and conductive heat gain on hot summer days. Heat discomfort may be reduced by shading windows and ventilation. 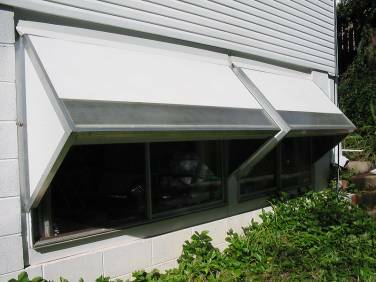 However, conventional shading devices may significantly reduce the potential for ventilation. A current policy (Qld Cool Schools Program) is to air condition insulated and well shaded classrooms. However, with conventional shading, classrooms must be electrically illuminated adding to the electrical load and the thermal load. The importance of adequate lighting in classrooms where children spend six hours a day reading and writing cannot be over emphasised. Sunlight is the optimum source of illumination and studies have demonstrated the health and productivity benefits of natural light. However, the provision of natural lighting in classrooms has proved problematic. In warm climates reducing radiant heat gain necessitates heavy external shading of windows. This greatly reduces the potential for natural lighting. Classrooms utilise wide eaves to reduce radiant heat gain. However these do not effectively reduce heat gain during the early summer morning and for this reason heavy external shading is often added. The result is minimal natural lighting. Light guiding shades (LGS) provide near optimal shading of windows and near optimal natural lighting of interiors. The technology, based on the principles of non-imaging optics, was developed in Australia specifically for shading and daylighting buildings in the subtropics and prototypes have been used in a number of buildings – notably the Brisbane Herbarium. A principal economy in using LGS is that it removes the necessity for conventional shading such as wide eaves, verandas, external shades or blinds. Therefore the cost of optimum shading and natural lighting with LGS can be offset against the saving on these conventional components. Fig 2 shows two LGS installed to shade windows of a residence in Brisbane. It is obvious that the LGS provide optimum shading of these windows and the interior of the building. What is not immediately obvious is that the LGS also provides well distributed natural light to the interior with zero glare. To do this the LGS collects a fraction of the sunlight blocked by the shade through a transparent aperture at the outer edge of the shade. This collected sunlight is diffused and reflected through the shade into the interior. For optimal illumination, free of glare, reflectors in the LGS distribute the sunlight near evenly over the ceiling of the room. When the ceiling is matt white this sunlight is diffusely reflected down onto work surfaces throughout the room. Fig 2. Light guiding shades over windows in a residence. The LGS in Fig 2 are light weight but extremely robust building elements manufactured from long lasting materials – Colorbond steel, aluminium framing, aluminium reflective material and twin wall polycarbonate. No component elements are subject to breakage or fire. The LGS may be installed in minutes by screwing to the wall surrounding the window. As the LGS are installed external to conventional sliding windows there is no possibility of weather ingress through the element to the building. In fact the LGS eliminates the possibility of accidental ingress of rain through open windows. An internal view of windows with LGS is shown in Fig 3. Fig 3. Sunlight collected by the LGS is distributed over the ceiling. 3. Physical principle of the LGS. The concept of the LGS arose from the need to shade windows without reducing natural lighting in sub tropical buildings. A major problem in Australia is radiant heat gain through windows. This is particularly severe for East or South facing windows in the morning (see Fig 4a) and West or South facing windows in the afternoon and can also be a problem for North facing windows in winter. The most effective conventional remedy for radiant heat gain is the 45 degree sloping shade (see Fig 4b). However this severely reduces natural lighting. To circumvent this problem the LGS was designed as a sloping shade that accepted part of the incident sunlight, diffused that sunlight so that it lost its directional dependence and reflected the diffused light through the shade and onto the ceiling in the room. Fig 5 shows a section through a typical LGS with the path of a few typical rays of the diffused light from the aperture indicated. The lower reflector is a parabola in section and the upper reflector is a plane reflector. It is possible to design the upper and lower reflectors in the shade so that the light emitted into the room occupies a specified angular range. Fig 5. Sunlight is collected through a diffusing aperture and projected through the shade onto the ceiling. In practical designs (see Fig 1, 2 and 3) the output light is emitted into the building in an angular range from a few degrees above horizontal up to about 70 degrees above horizontal to ensure the window is glare free. As the input light is diffused at the entry aperture the output distribution is independent of the input direction of the sunlight. Therefore the LGS behaves much like a conventional luminaire giving an unchanging light distribution within the room. A different, but very desirable, feature of the LGS relative to conventional luminaires is that, as the output light is directed upward, the output aperture appears relatively dark (low glare) when viewed from inside the room. There are two aspects to the thermal performance: improved shading of windows and improved insulation of windows. The improved shading results from the much better shading geometry of the LGS relative to roof eaves. This is illustrated in Fig 6. Fig 6. Window shading is superior to roof eaves in blocking low elevation sunlight. Fig 6 illustrates sunlight incident at about 30o elevation (7 am in Summer) on a window with an LGS similar to the LGS of Fig 1. It is evident that the radiant heat input through the window with LGS is reduced to about 1/4 of the heat input through a window shaded by eaves. Conventional eaves are ineffective for shading summer sun between 5 and 9 on summer mornings. As a result, when school starts at 9 am classroom interiors have been heated for four hours and are excessively hot. Either high capacity ventilation or high capacity air conditioning must be used to bring the classrooms to an adequate level of thermal comfort. The air conditioning must remove the accumulated heat from the building; thus the effective air conditioning load is substantial. The conventional solution to this problem has been to hang vertical louvres from the edge of the eaves. This is expensive, greatly reduces natural light and is subject to weather damage. Most of this radiant heat gain problem can be eliminated by using LGS on the windows. The LGS is a fully enclosed system. It is not in thermal contact with the window. This means that any heating within the LGS due to losses is dissipated to ambient through the substantial external surfaces of the LGS. Light distribution: The output light distribution from the LGS to the interior is independent of sun position and the distribution is, by design, near optimum. Quantity of light: An important aspect of performance is the amount of natural illumination delivered to the interior. 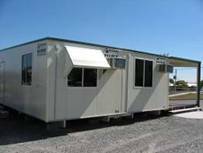 A typical relocatable classroom has a floor plan 8 m wide and 16 m long and a floor space of 128 square metres. Assume, for simplicity, that windows occupy 3/4 of the two long sides of the building i.e. a 24 metre length of windows. In a typical LGS (e.g. Fig 1) the input aperture is 0.2 m high. If all the windows have LGS the available light collecting aperture is 0.2x24 = 4.8 square metres. Direct sunlight from above is incident on the LGS aperture at about 45 degrees and provides an incident luminous flux of 100,000 x 0.7 x 4.8 = 336,000 lumens. The efficiency with which this is transmitted by the LGS to the interior depends on transmission losses at the various interfaces. Approximate losses are as follows. At the twin wall polycarbonate input aperture, 0.8; on reflection inside the LGS, 0.9; at the output aperture, 0.9; and at the window (assumed closed) 0.9. Thus the overall transmittance is 0.58 or an efficiency about 60%. Thus 336,000x 0.6 = 202,000 lumens are distributed by the LGS over the ceiling of the classroom. Assuming a ceiling reflectance of 90%, the down welling illumination reflected from the ceiling is 180,000 lumens. As the luminous output of a 40 W fluorescent tube is about 3000 lumens, 180,000 lumens is equivalent to the illumination obtained from 60 fluorescent tubes. Assuming 50% of the ceiling reflected light falls on the work (floor) area of the room the illuminance there is 90,000/128 = 700 lux. This is more than twice the recommended illuminance level (300 lux) for classrooms. In overcast sky conditions the illuminance may be reduced to about 20% of the above i.e. to 140 lux, about one half the recommended minimum illuminance level. Thus, conservatively, one half of the electrical lighting in the buildings can be safely eliminated. 6. Economics of the Light Guiding Shade. There are several aspects to the economics. These relate to installed cost and to running cost. (1) The LGS removes the need for wide eaves in sub tropical buildings. This significantly reduces roof and roof framing costs and this offsets the cost of the LGS system. In a building with an 8 x 16 = 128 square metre interior floor plan, one metre wide eaves on the long sides of the building result in a roof area of 10 x 16 = 160 square metres. Eliminating the eaves reduces the roofing by 20% and the roof framing by a larger percentage, typically 30% see Fig 7. Fig. 7. Eliminating eaves offsets the cost of light guiding shades. (2) The LGS removes the need for heavy vertical external shading. A major problem with school buildings in the sub tropics is radiant heat gain through East or South facing windows during the morning hours from 5 am to 9 am in summer. This results in excessively hot classrooms at the start of school. 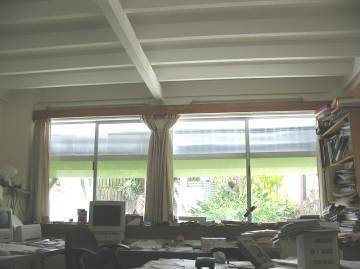 Wide eaves do not effectively reduce this heat gain and, frequently, heavy external shading, hung vertically from the eaves, is required. LGS, as in Fig 1, shade windows much more effectively against low elevation sunlight than eaves and obviate the necessity for vertical external shades in buildings with facades facing East or South. (3) The LGS reduces the installed quantity of electrical lighting (number of fluorescents) by at least 50%. It is probable that the reduction in costs of roofing, external shading, electrical lighting installation and air conditioning capacity will largely offset the cost of installing LGS. However, detailed costing of these cost reductions relative to the fabrication and installation costs of LGS, is required in specific projects. Running costs of air conditioning. LGS reduce air conditioning load in three ways : reducing the direct thermal load due to radiant heat gain, reducing heat transfer from the ambient and reducing the indirect thermal load due to electrical lighting. Radiant heat gain through windows occurs mainly during the morning hours between 5 and 9 in summer. The heat gain can approach 1 kW per square metre of window area. For an East facing classroom this may amount to a 20 kW input during morning hours. This thermal load accumulates in the classroom structure during the four hours before class begins and can equal the thermal load that flows into the building during class hours. Eliminating most of this early morning heat gain with LGS can, therefore, very significantly reduce the overall air conditioning load. With fluorescent lights much of the input electrical energy appears as IR radiation and convective or conductive heat. Typically, less than 1/3 of the input energy to fluorescent tubes appears as visible light energy. With sunlight, the proportion of energy as visible light is considerably higher. Therefore the overall energy input to a building can be significantly lower when natural light rather than artificial light is used to supply the illumination. However the actual reductions in energy input depend strongly on how sunlight is distributed in the building. For example, if the sunlight were to fall directly on floor coverings, almost all the radiant energy is converted directly to heat energy with almost no illumination effect in the room. This heat energy must be removed as part of the air conditioning load otherwise the interior temperature rapidly increases. The LGS delivers all input light upwards over the ceiling providing much more efficient illumination. In bright conditions LGS can supply all of the illumination requirement of classrooms. Thus, during most days in Australia, no electrical lighting will be used. During overcast or wet weather LGS supply at least half of the required illumination. On these days supplementary electrical lighting is required. However, the installed amount of electrical lighting can safely be halved in classrooms used only during the day time. (1) All losses within the LGS are external to the building envelope and therefore do not add to air conditioning loads. (2) The use of LGS ensures that no direct sunlight falls on floor coverings or work surfaces avoiding glare to occupants and fading of materials. (3) No input light from the LGS falls directly on floor coverings where it would be uselessly converted to heat. All input light from LGS is reflected down from the ceiling providing maximum illumination from the input energy. (4) As the input aperture of LGS is relatively small compared with overall window aperture, e.g. a 0.2 m high LGS aperture as compared with a 1.2 m high window aperture, the use of spectrally selective thin films in the LGS aperture to further reduce the heat gain associated with illumination is much more cost effective than the use of the same films on windows. (5) LGS are much more effective natural illuminators between 9 am and 3 pm in summer than are conventional windows. This is due to the fact that the apertures of LGS directly intercept high elevation sunlight and direct an adequate proportion optimally into classrooms whereas vertical windows intercept no vertical sunlight and are therefore poor illuminators. Reduced building maintenance relates to reduced cyclone, hail and vandal damage. Cyclone damage. Cyclones are potentially very damaging in the tropics and sub tropics. Major damage occurs due to upward force on the roof that may lift roofing material, the entire roof or the entire building. This force is due to the pressure difference induced by wind flowing over the roof and is proportional to the roof area. Without eaves the roof area is typically 20% smaller than the roof area with eaves. As a consequence cyclonic forces on the building are reduced by 20%. Hail and vandal damage. Windows in classrooms are susceptible to damage by projectiles due to hail or vandals. The closer fit of LGS to windows compared with eaves reduces the area of windows exposed to projectile impact by more than 70%. Further, the exposed area of LGS is twin wall polycarbonate which is extremely resistant to impact damage. The potential for reduced greenhouse gas emission is significant and is directly correlated with the reduction in the costs of electricity for air conditioning and for lighting. As all components of LGS are external there is no possibility of deleterious effects on the interior due to out-gassing of materials. Fluorescent lighting may itself have some health problems with a small proportion of children so any reduction is desirable. The new 16 mm fluorescent tubes have very high luminance and may constitute a source of disability glare. The even ceiling luminance obtained with LGS is much less likely to be a source of disability glare. The LGS is a light-weight, inexpensive and robust building element that provides the dual function of shading and natural lighting in a modern, streamlined form that integrates very effectively onto a building façade. The internal view of windows with LGS presents an unimpeded view through the lower half of the window and a very low luminance source of natural light over the upper half of the window (see Fig 3). The LGS is robust, (the under part of the shade is folded Colorbond steel, the upper part of the shade is twin wall polycarbonate). The LGS is screw or bolt fixed to the building façade via strong aluminium L sections. The LGS is mounted external to the building and has no inflammable parts so fire risk is very low. The LGS mounts over the upper part of conventional sliding windows and is above the reach of children outside or inside the building. With the LGS installed the lower 2/3 part of a sliding window may be opened to the outside for ventilation or for exit in emergency situations. Currently the LGS, Australian Patent 657749, is not licensed to a commercial supplier. It has been used as a prototype, notably in the Brisbane Herbarium where design and installation was carried out by a Gold Coast firm. The LGS on the Herbarium are extremely robust and blend well with the building façade. The lighting performance, while adequate, is somewhat compromised by a less than optimal output aperture area and the unwise use of dark green surfaces internal to the shade. The LGS shown in Fig 1 were designed for residential application. They are light-weight, inexpensive, robust, simple to install and the fabrication includes high quality reflective material to maximise the optical efficiency. These LGS have been operating for six years without maintenance. The operation of this installation may be viewed by arrangement with Ian Edmonds, (Ph 07 3378 6586). The LGS are modular in construction and it is expected that about 20 per day could be assembled from components by two workers. It is envisaged that LGS of this type would be manufactured and marketed under licence by a local manufacturer of buildings or building components. Licensing to include a royalty on each unit marketed and a minimum annual royalty to be negotiated. Edmonds I. R. (1992) Permanently fixed collimation devices which combine the function of shading and daylighting building interiors. Australian Patent 657749.